While I’ve been recovering from my operation, I’ve been lying in bed reading a lot of books. It has been commented, by people that know me personally, that I read a lot, and that I read very fast. Some have even suggested that I ought to slow my reading pace because it is uncomfortable for them to watch me race through book after book. Indeed, there are times where I take a week or two or three off reading books, and read only my regular Bible readings, so that my brain doesn’t explode from the reading. I bought two fantasy-genre novels before my operation and, almost a week later, have finished both of them. I couldn’t put them down, and was struck by their originality and depth of meaning – so I thought I’d mention them here. Graham, L. B. (2004), The Binding of the Blade Book 1: Beyond the Summerland, Phillipsburg: P&R Publishing. This book kept me compulsively reading it. It’s fairly lengthy compared to the normal size of the novels I read, but that said, I managed to finish it within a week. So that really says something. When I wasn’t reading it, I was thinking about it. I found myself really caught up in the characters. The story is mostly told around the journey of the hero Joraiem. Destined to be one of the leaders of their country, he journeys to the ancient city where his country’s leaders have been trained for generations. When the training takes an unexpected turn, they journey over sea and land to fight an ancient foe. There are great characters – a wise prophet, a beautiful princess, galloping horses, a warrior tiger, talking bears, magnificent dragons, and evil enemies. It’s one of the better books I’ve read in the fantasy genre. There’s a lot of unexpected twists and turns. Admittedly I wish the ending was a little different – though it felt appropriate to the grand and epic tale, it left me feeling rather sad. Hopeful, but sad. Nevertheless, it was a brilliant story and I feel all the more enriched because of it. Now I have to save up some money to buy the rest of the series now and find out what happens next! Overstreet, J. (2007), Auralia’s Colors, Colorado Springs: WaterBrook Press. This is the story of a baby girl found in the wilderness. As she grows, she is found to have a mysterious gift that could disrupt the laws of the nearby town. It’s a mysterious tale, I found it fascinating, if not a little dark. It was definitely entertaining and full of drama. It made me ask a lot of questions – who are the truly evil? Why have laws for merely law’s sake? What lengths would people go to to enforce social divisions? Why would a society silence the spiritual from open discussion? I have no idea if that’s what the author intended though, and I’m not postmodern enough to suggest that the author’s purpose and motive ought to be discounted! It was definitely a fascinating read. Hi, readers, just letting you know that I’m having an operation this weekend. As a result, I may be taking a break from blogging while I recover. I have been told the recovery will take around 2 weeks. So, please add me to your RSS reader bookmarks, and it’ll let you know when I update this blog – or check back in in a week or two! How are people finding this blog? Some of the searches people use to come across my blogs have been quite entertaining to read. Others show a bizarre cross section of different reasons people read my blog – from art through to questioning the issues of spirituality. I have photographed them… I don’t recall painting them, sorry! ▪ is biblical creationism reasonable? I didn’t think it was that awesome a name, but hey, thanks for the compliments! I like that typing in the genus name of an extinct species of reptile directs people to me! Sorry, I’m not of Chinese cultural heritage. Some of my friends are descended from Chinese ancestors, but I don’t know that any of them are vegetarians! I’m pretty sure they didn’t have cameras back then. No, don’t eat your Bible. Yes, God’s Word can be called the bread of life, but it’s in a metaphorical or spiritual sense. It’s not actually made of bread. It’s also gluten free. No doubt related to the question, “why do Christians believe in monogamy if there’s so many polygamists in the Bible?” I linked my fizzy musings post (fikalo.wordpress.com/2007/11/07/monogamy-and-the-bible) to this question to the article at creationontheweb.com/content/view/3356. The dinosaurs were evidently eating lemons when Noah welcomed them onto the ark. The question is, was the person looking for a vegetarian resource called the “Vegetarian Bible,” or were they looking for information on people who are Bible-believers and vegetarians? On the latter topic, I wrote a post at fikalo.wordpress.com/2007/10/29/bible-believing-and-vegetarian. Conner, K. (1980), The Foundations of Christian Doctrine, Vermont, Victoria, Australia: KJC Publications. I’ve lost count of the times I’ve told people that this is a great book. I found it an essential part of my Bible study reference books. I regularly consult it for information. It offers an easy-to-read study guide on the key aspects of Christian doctrine. The author is a renowned Bible teacher who makes the dry-sounding topics of doctrine come to life. I have had the privilege of hearing him teach on a variety of topics, and each time I have come away with a renewed passion for the Bible, and a new level of understanding. It covers all the essential basics, in easy-to-read plain English, with plenty of detail for the more experienced student, and enough to keep the new Christian occupied with Bible study for a long time! Topics include the nature of God, the condition of humanity, things like angels and demons, salvation and eternity. The Lord is amazing, awesome, wonderful. He is so immensely great, so massive, that the entirety of the heavens – the universe, and all within it, can be measured in His hand! All that we see in the universe, the magnificence of the sun, moon, stars, distant galaxies, was commanded into existence by His voice. Yet God, in His omnipotence, is also immanent. He is here. He is Immanuel, God with us. He is so immense, yet here is close enough to be with us. He sustains me in the difficult times. Even when I can’t sense His presence, He is here. When life has become a difficult journey through a dry wilderness, where death and danger lurk at every corner, He is here. He triumphs in this wilderness. What would I do without the sustaining peace and joy of my Lord? Life has been hard, so hard lately. Disease, sickness, exhaustion and frustration mark every week. Jealousy and envy threaten to take over when I feel like others are more favoured than I. But I realise that I have been seeking the temporary, the momentary comforts and pleasures of this mortal life. I seek my Lord, I look beyond this life, and look to that which is unseen. And it is there that I find my peace. There is more to life than this moment on Earth. So I remind myself to live with my eyes on the One who is greater than the Earth, greater than the world. What can this life offer but fleeting moments of comfort, money, possessions, the applause of mortal men? It pales when I look upon the God who made the entirety of the universe with His command, who, in six days, fashioned the Earth, heavens, and its myriad beautiful creatures. He is so great, yet He cares deeply for the destiny of those who walk this Earth. What more can I want but to live in His presence? • Genesis 1:14-19 – the creation of the sun, moon and stars. • Genesis 1:31 – the very good creation completed in six days. • 2 Corinthians 4:8-18 – life can be difficult at times, but with the life of Christ within me I am sustained. I look to the things that I cannot yet see; and I look beyond the temporary world in which I live right now. • Galatians 5:19-21 – the sinful nature brings jealousy and envy. omnipotence – this word means “all powerful,” and is used to refer to God being the most powerful being in existence. immanence – this means that God sustains and pervades the universe – that is, He is all through the universe. He is close, nearby, and able to be everywhere. 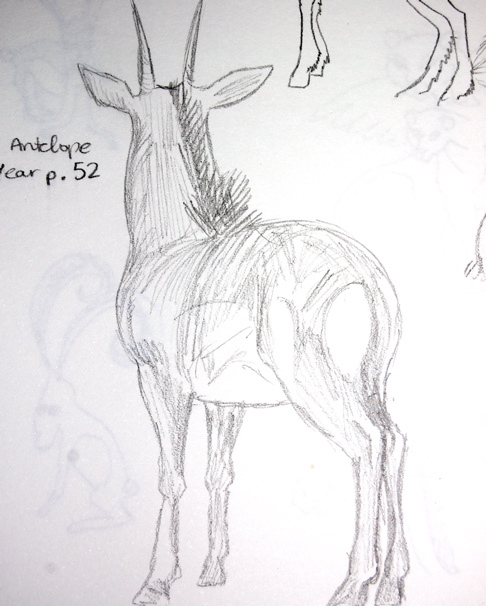 Antelope Sketch – Pencil on paper. This is one of my sketches, “from the vaults.” Drawn in 2005, it was inspired by a nature reference book photograph of a Sable Antelope (Hippotragus niger). This photo was taken at the old family farm. We went there last week for a visit to my relatives. I miss that place so much, where most Saturdays I’d go there to help out. It was a dairy farm for the most parts, but at times also ran beef cattle and other assorted livestock. The family lives in a newly built house a little way down the front paddock, but this photo is of the doormat at the entrance to the old house. It hasn’t been that many years since they moved into the new house, so I was amazed to see just how quickly the garden moved in to overtake the house. The once clear view from the lounge room window is now obscured by masses of trees. Ferny tendrils have pushed in under windowsills. The sight of the doormat really affected me. Perhaps it’s because I remember it as a fully intact mat. I’m pretty sure it used to say, “Love is… a warm welcome,” with a cutesy image of two naked people hugging. An innocent image, not smutty – just to clarify that! 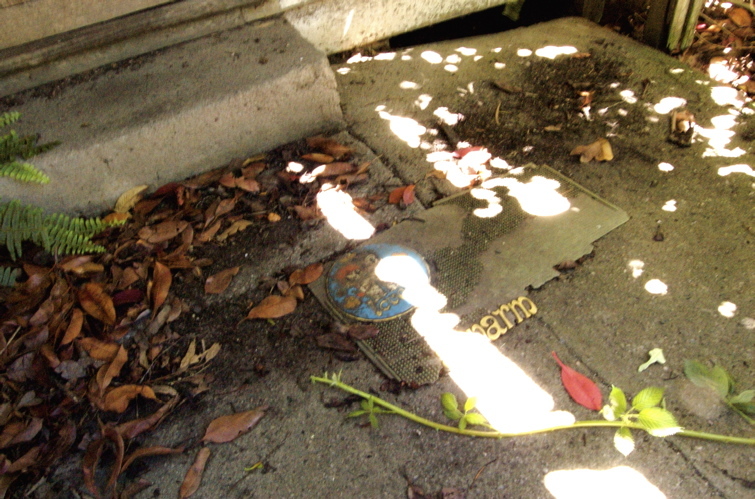 Now here it was, ripped in half, in tatters, obscured by the leaves and plants that encroached on the old house. How many times had I once crossed over that mat, stepped indoors – without knocking on the door – and run down to greet my grandparents in there? Like I said, I was usually there on a weekly basis through my childhood. We had grown up in the town just 15 or 20 minutes’ drive away. Now, here I was, only six or seven years since I last stepped inside that particular house, and feeling just how quickly things had moved on. The day prior to last week’s farm visit would’ve been my grandfather’s 87 th birthday – but he passed away in September 2007. It really hit me – he wasn’t there anymore. Because I had become quite ill shortly after his death, I had not spent time grieving. Now, it was beginning to well up within me, this immeasurable sense of loss. In the last few years since I first moved out of my parents’ home, I have lost both my grandfathers. It is still astoundingly painful, at times, when I reflect on their loss. They were such an integral part of my life, and now there is this gaping spiritual hole where they once were. This grandad, the one from the farm, was a big part of my life. How grateful I was to have him in my life for almost 26 years. Not only did we see him regularly at the farm, he was sports teacher at my school, and a swimming coach at the local swimming pool. I often attended mass with him on a Sunday morning, where he’d always buy me a large bag of mixed lollies. We would often talk, and I’d listen to his tales of fighting in the Second World War. My other grandad, the one who lived just around the corner in our country town, was the local public school principal (I went to the Catholic school). He would often take us on day trips to various sights, whether impromptu visits to the beach (about 20 minutes away), to movies, or tourist attractions. He helped me develop a thirst for learning that he demonstrated throughout his life. He passed away when I was barely 20 years old, and I’m so grateful that one of the last few times I saw him alive was at my wedding, the first day in a long time that I had seen him outside hospital. He died relatively young, in his 60s, and it was a tragic and unexpected passing. I can’t explain how much I miss my grandfathers. I feel so sad that my own children never really got to know their great-grandfathers. I was pregnant with my eldest when the first grandfather passed away. My children did get to meet farm grandad, though, something for which I am grateful. Their great-grandfathers on their father’s side had died many years ago, well before I met my husband. It often strikes me just how quickly time moves on. It reminds me of that C.S. Lewis quote, where he says that the only reason we ought to be surprised at time is if, ultimately, we’re called to be eternal beings. Brothers and sisters, we do not want you to be uninformed about those who sleep in death, so that you do not grieve like the rest, who have no hope. We believe that Jesus died and rose again, and so we believe that God will bring with Jesus those who have fallen asleep in him. According to the Lord’s word, we tell you that we who are still alive, who are left till the coming of the Lord, will certainly not precede those who have fallen asleep. For the Lord himself will come down from heaven, with a loud command, with the voice of the archangel and with the trumpet call of God, and the dead in Christ will rise first. After that, we who are still alive and are left will be caught up together with them in the clouds to meet the Lord in the air. And so we will be with the Lord forever. Therefore encourage one another with these words. You are currently browsing the The Amalgamation blog archives for February, 2008.